Its funny… how a broken metal sprocket leads to a huge project! LOL! I was heading out to buy some more chalk paint and run some errands. As I was heading into the garage I pushed the button for the garage door to open and I hear a loud cranking noice I hadn’t heard before. As I took one step into the garage, there was a loud crunch and snap noice, the drive change sprocket had broken and came hurdling at my head! Turns out this is just what the doctor ordered. A perfect excuse for my husband to order a new garage door opener and begin his Harley Davidson garage remodel! 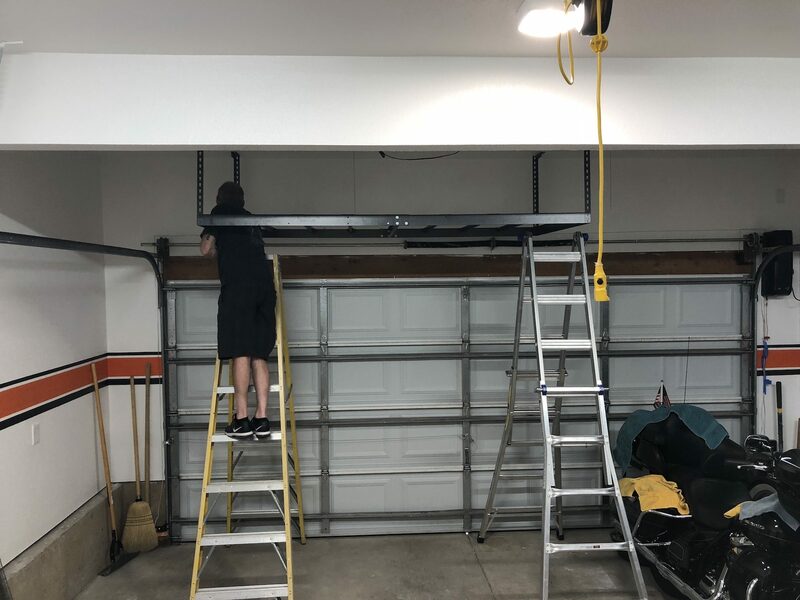 I was right, the garage door is now considered “dead” to my husband. 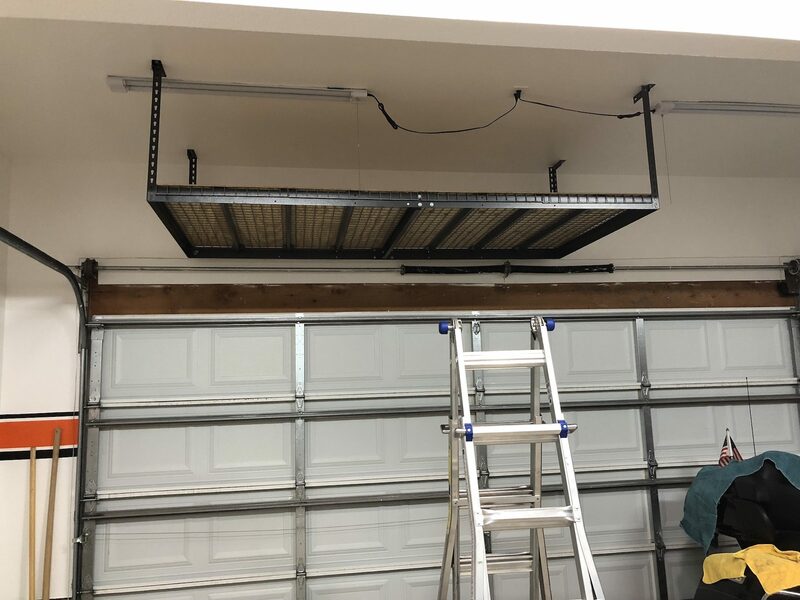 It was the perfect storm to buy a side mount garage motor he has been wanting for a few years now. 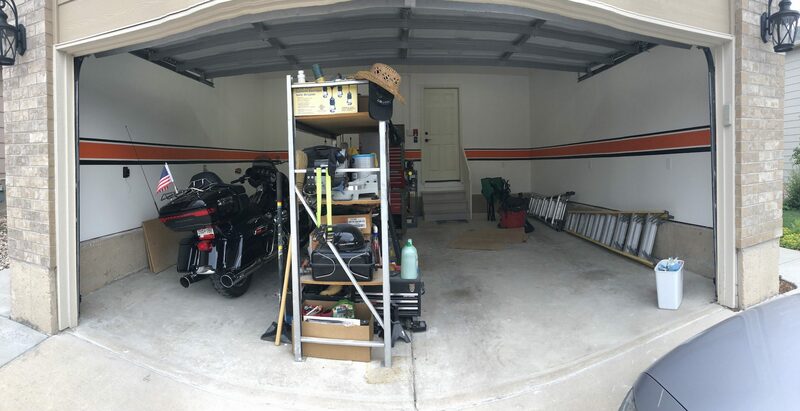 The installation of the new Lift Master 8500W motor gave us much more space above the garage and it’s so quiet, too! 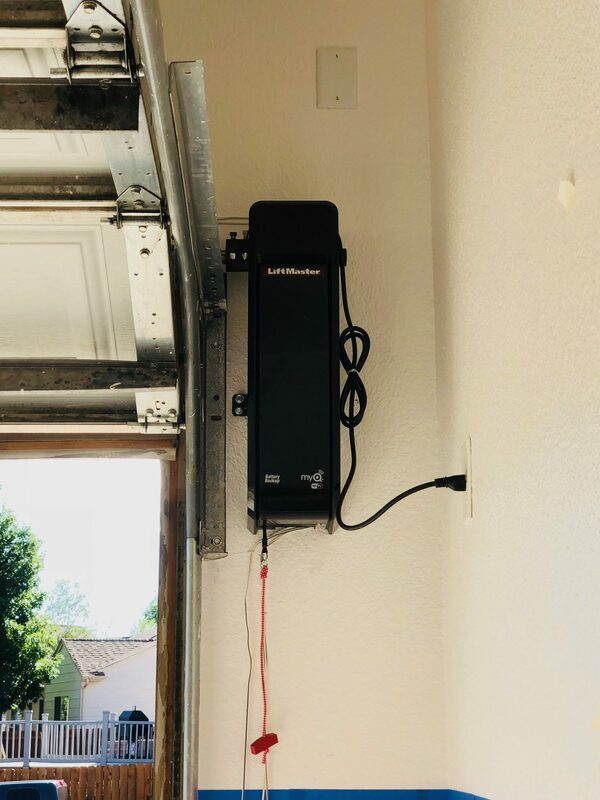 The coolest thing about the new garage door opener is that you can open and close the garage from anywhere you have an Internet connection! 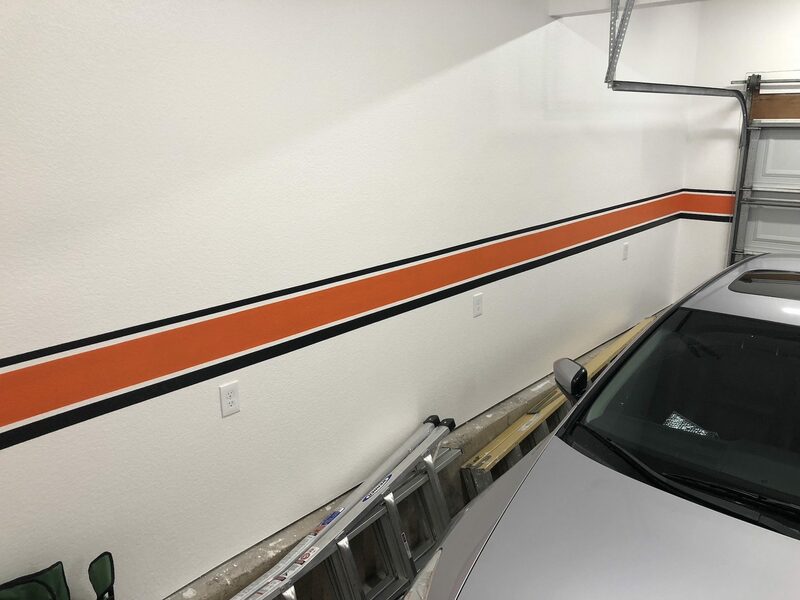 “Yes, I want to paint Harley Davidson stripes along the garage walls before the cabinet installation,” he said. Oh boy, here we go! 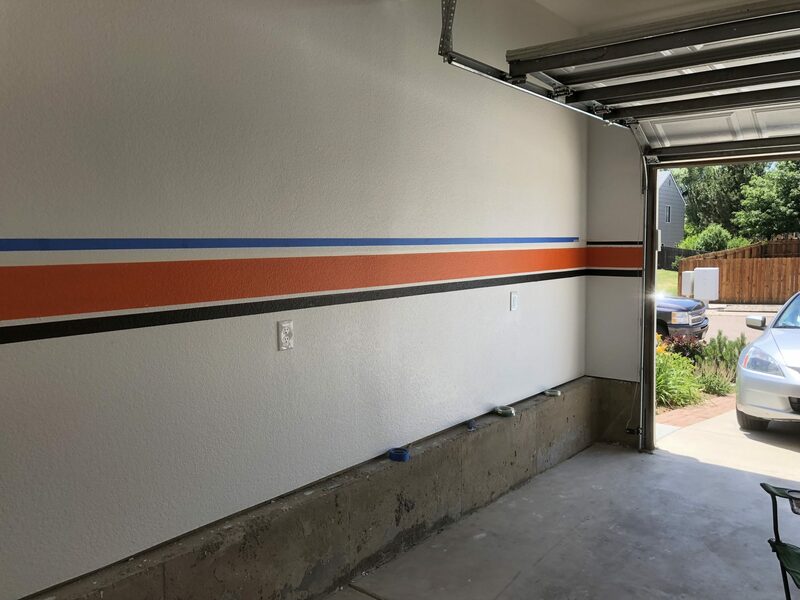 But first, “I want to paint the garage with Harley Davidson stripes!” … What? You would think finding the right Harley Davidson orange color wouldn’t be hard, well let me tell ya, it was. 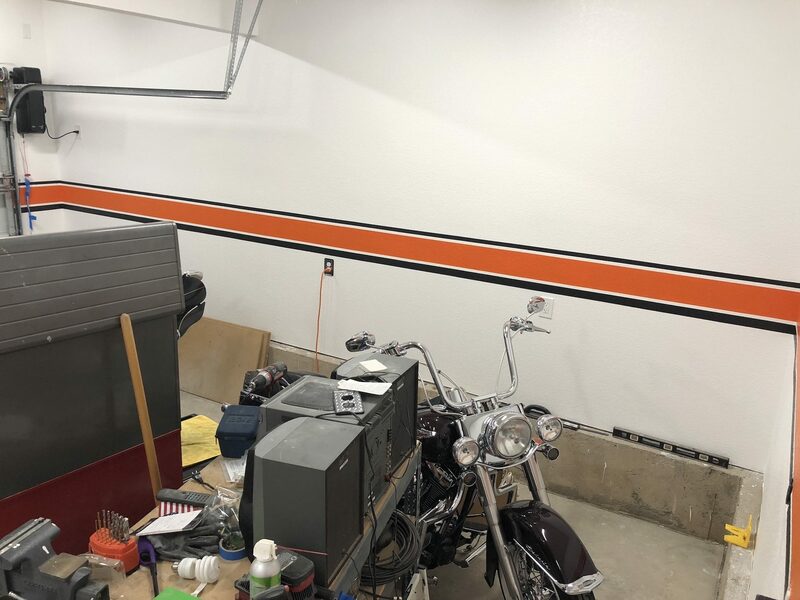 After two paint samples, I headed to the Harley Davidson dealership and grabbed a couple of inexpensive items with the orange logo and packaging to see if my guy over at Steve’s Paint here in town, could get the color right. Well, we got to a color we liked and what we thought was close enough. Turns out that Harley’s quality control of their printing seems a bit liberal to say the least! 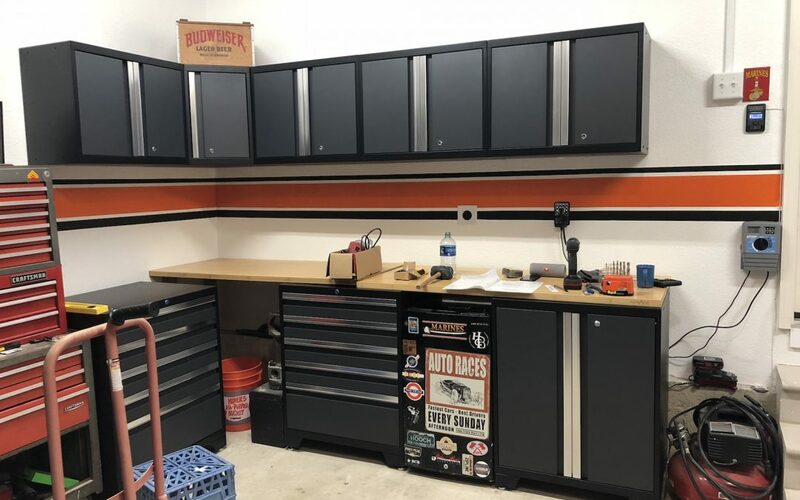 As we looked at many different logos and packaging samples, we discovered several variances of Harley Davidson orange, so we ended up choosing a color that we thought was the right Harley Davidson color we liked. 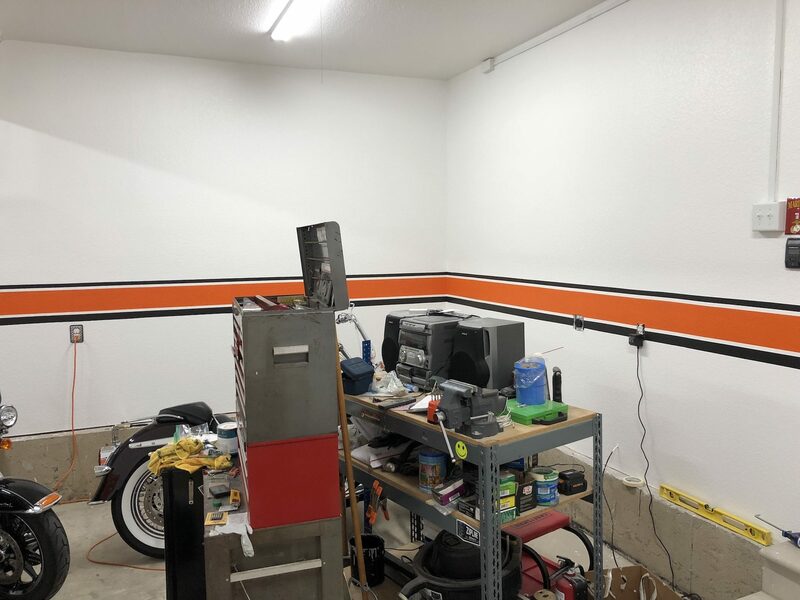 It was time to paint the HD orange and black stripes on the garage walls as we waited for cabinets to arrive. How the HELL are we going to get the stripes perfectly spaced and level? However, Bruce had this all figured out. 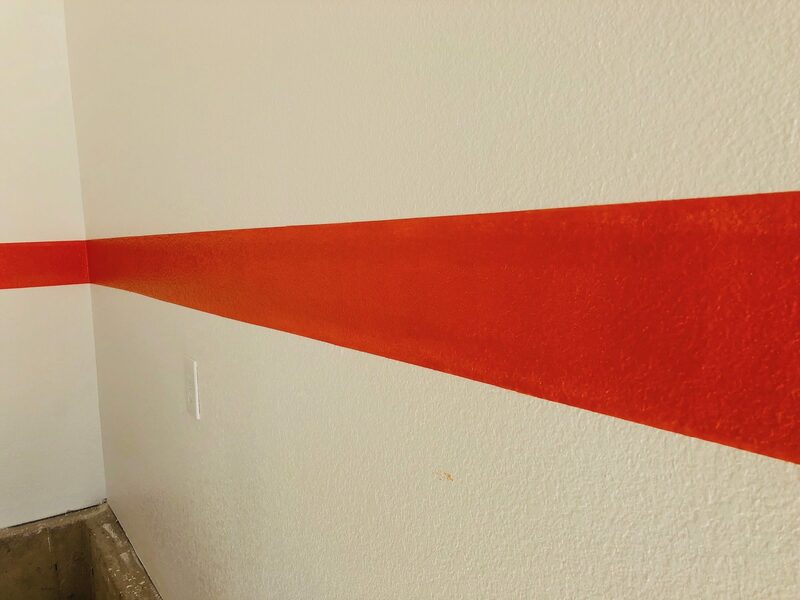 He was going to use a laser level to draft the stripes on the walls. Turns out the our neighbor Chris had a laser level and Bruce began markings the placement of the stripes. After a few hours he had come up with his stripe design and it came out straight and the stripes were evenly space. Good job! Only painting the inner part of the strip first. 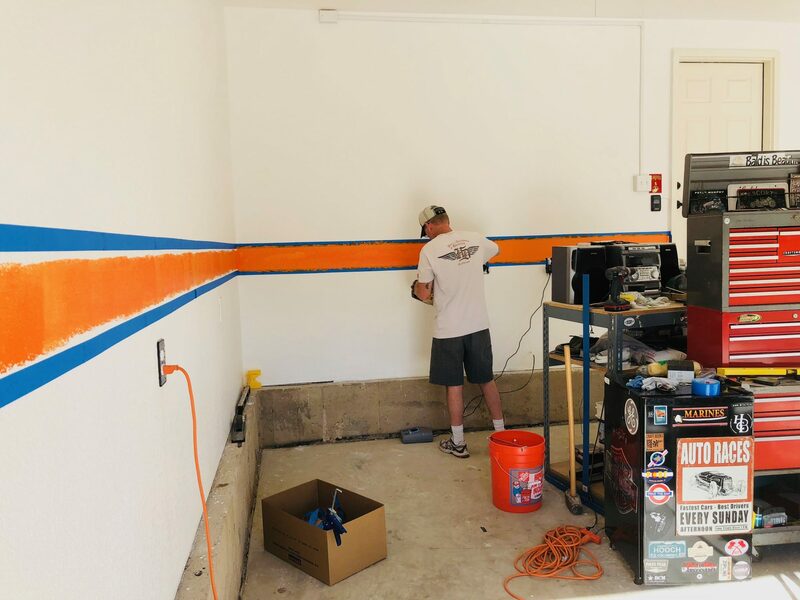 Mapping out the paint stripes is harder than it looks but after our initial stripe markings, we still needed to make an adjustment to the back corner of the garage because the floor was slightly higher but we made it work. As it turns out the cabinets were placed in front of this area anyway, but we knew the stripe was straight. LOL! Now comes the acrylic caulking… the trick to a perfect line on a textured surface! We took some advice from this guy who showed us how to paint perfect stripes on textured walls. It worked perfectly! It was just amazing HOW WELL IT WORKED! Watch the video HERE on Youtube. 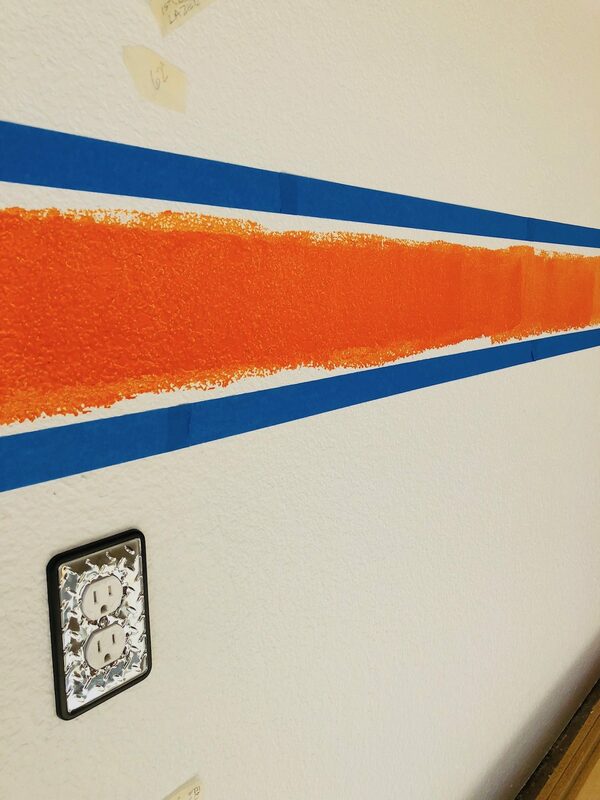 STEP 1: Layout your stripes and set up your paint and brush. STEP 2. 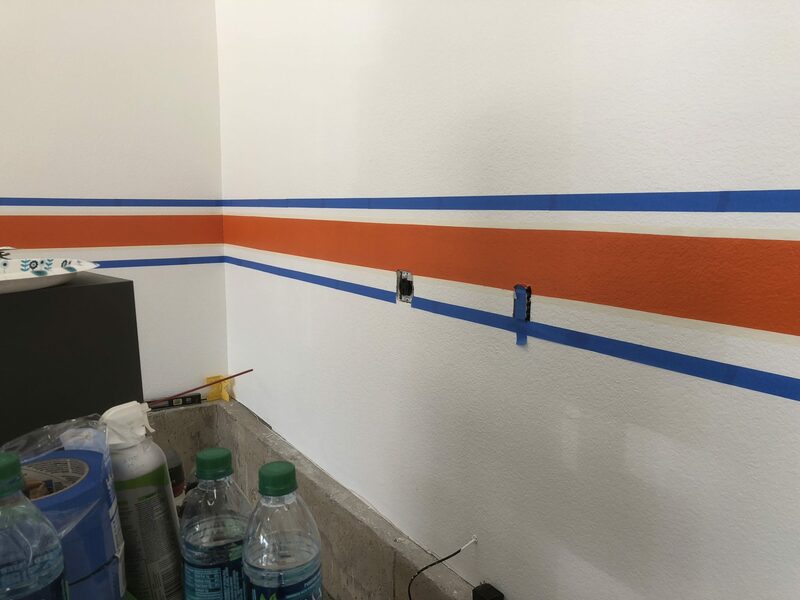 Place a thin line of acrylic caulking along the edge of the masking tape (where you are preventing paint to seep through) and smooth the caulking with your fingers to create a seal between the tape and the texture wall. STEP 3. Quickly paint RIGHT OVER THE CAULK. The acrylic caulk creates a seal and prevents the paint from bleeding on to the textured wall! Pure Genius! Note: Begin with a small-medium area to prevent the caulking from drying. STEP 4. Lastly, remove the tape when the paint AND caulk is still WET, otherwise the caulking will dry and will show a gummy spot. Bruce caulked the tape line and smoothed out the caulking and I painted right after; definitely easier as a team effort! 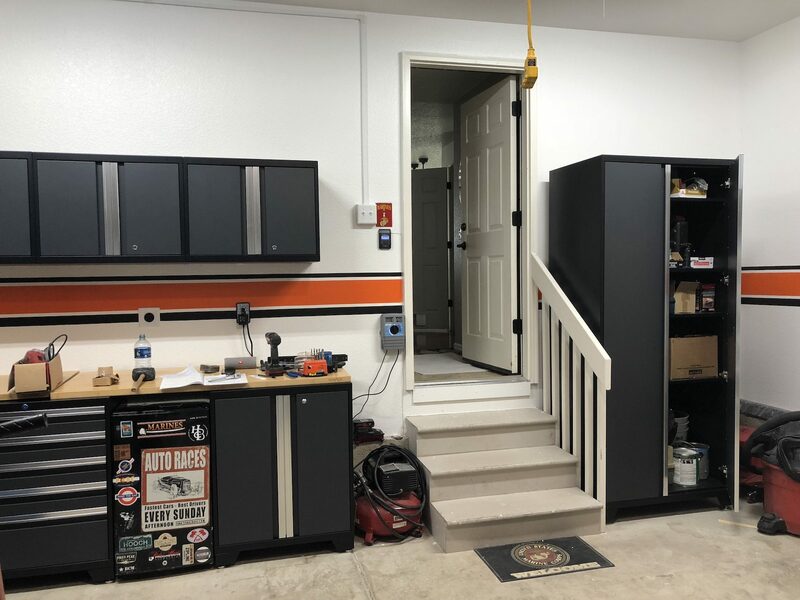 Cabinets are in…HD decor will be added and garage flooring to come? 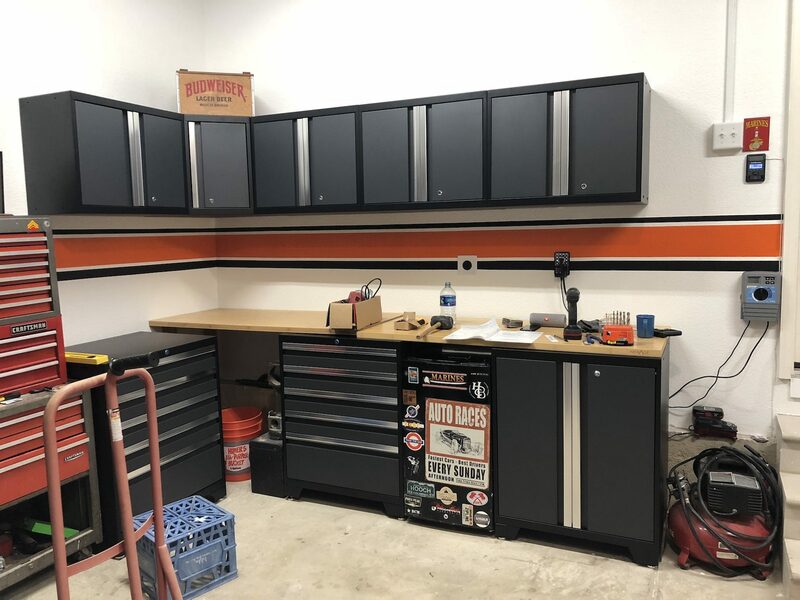 Our unexpected little project came to an end, but the garage floors still remain in the near future, but we are very please with our DIY garage remodel. It’s clean, simple and is just enough “Harley Davidson” for the both of us! Wink-wink. Now? . . .What about the new flooring for the house, honey?